How do you dive into the development of such complex characters as you feature in your books? Do you know the character before the story, or create the character to fit your story idea? First of all, thank you for the compliment. I have ideas about the history of the characters, who they are, what they’ve been through, where they are going, etc. BUT, their journey always introduces me to new elements of their character even I didn’t know beforehand. It’s an organic flow, developing them through time and journey, in the same fashion all of us become who we are. How does your workspace look like? Do you work from a home office, write anywhere you can find time and space, or do you need to get away from it all, and work from a cafe somewhere? I have three different work spaces. My office is set up and organized for all my business needs. Then, I have a folding table in my living room for day to day administrative work because, well, my office is freezing and I don’t like being in that ice box if I don’t have to. When it comes to writing though, that leads me to my third workspace—wherever I feel comfortable and motivated by my muse. Could be on my bed, on the couch, in my recliner, outside, in a coffee shop, wherever! Comfort is key when I’m clicking away and building worlds. What is your favorite aspect of the writing and creation process? 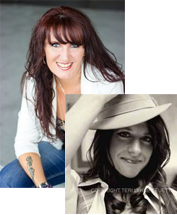 On this particular project, which was my first collaboration, it was working with Tish Thawer. We wrote the book lobbing it back and forth, chapter after chapter, to each other. To see where she went with her sections, then taking the ball and running with it was an incredibly fun exercise of the craft for me. I hope she enjoyed it as much as I did. Which part of this process to you dislike the most? I really can’t think of anything! This whole project has been fun! Do you have a writing ritual? A favorite cup of tea, a specific pen, or a playlist that you always have to play in order to get into the “Zone”? I need something yummy to drink, a quiet corner, and a comfy chair. I once read an interview with Stephen King where he talked about the importance of writing every day. Even if it’s only a thousand words, it’s progress. I make it my goal to work on my books, even if all I can spare is an hour, every day. It might seem like bite-sized moments of time, but it adds up fast. 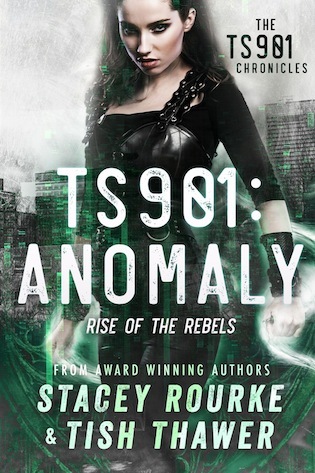 What has drawn you to write a dystopian novel, like TS901, rather than any other genre? What do you like about this genre the most? I can’t say I ever set out to do dystopian, or that I ever particular targeted a genre. The story ideas come first, in developing them is where the stage gets set. But I do like to challenge myself by trying out different genres. So far, I’ve done young adult, suspense fantasy, romantic comedy, fairy tale retelling, and now dystopian. I can’t wait to see where I’ll go from here! Thank you, Stacey, for taking the time to answer my questions today. Here is some more info about TS901, and of course a giveaway at the end. Good luck to all those who enter!